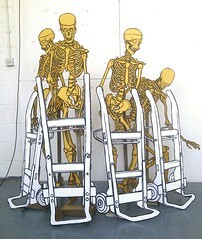 Here yellow skeleton and sack trolley drawings are combined. This is now a lot more about physical objects than flat drawings. The objects are drawn life-size from an anatomical plastic human skeleton and a sack trolley, using a stick of black oil pastel straight on to white and yellow cartridge paper. 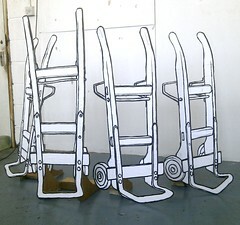 Each drawing is mounted onto cardboard and cut-out. The filter canister is detachable and so effectively a separate object to the mask, and so I drew it separately. The masks are drawn with white oil pastel on black paper and the canisters with black on yellow paper. All of the drawings are cut-out on thrown-away cardboard and elevated away from the wall. By bringing the drawings out into the room and away from the wall I hope to liberate them from the flat existence usually associated with drawing. Are these drawings now sculptures? I think they are both drawings and sculptures and perhaps it’s a shame to have to differentiate between the two.